The Inspired Room is one of the top decorating blogs on the web. I’m glad you are here! For more inspiration, visit my inspiration galleries, the popular How to Decorate series and my own House Tour! Thanks Barbara :-) …. due in great part to your helpful referrals ha! Love, love, love! Everything about it is spectacular. AMAZING! And thanks for answering a question that’s been troubling me… I want to take our subway tile to the ceiling but I’ve been nervous about what it would look like without any crown molding. And you’ve proven that it is in fact awesome :) Beautiful, beautiful, beautiful! Yes! When I get to do the full kitchen post you’ll see it even better! :-) Thanks Jessica!!! Love the subway tiles.Love it all! I recently renovated my kitchen. What color grout did you use. I have granite counters where the backround is white w/cream an hint here and there of blue grey and also black and taupe. My kitchen cabinets are white with the brushed stainless. My Island is expesso. I’m having a hard time with the back splash which i’m also doing at the wine bar.I have subway tiles left over from my bathroom and love them..so classic. I was think of using them but with a darker grout. What do you think? But it in no way looks this good! …well, I did do mine on a very slim $0 …(that’s ZERO dollar budget… I’m pleased with how it turned out…but my, my my! It certainly is looking lovely! You have picked some gorgeous finishes. Even the knobs are delicious!! I bet you’re in love with it, it’s a stunner!! Just gorgeous and I love the dark cabinets with the white subway and quartz countertops. Wow Melissa, this is stunning! I love what you’ve done, it looks so bright, fresh and crisp. I can’t wait until we paint our cabinets. Have a great day! This is absolutely beautiful! So bright and cheery. Looks like a great place to cook. Congrats! Your kitchen looks so great! I love the tile and the two tones on the cabinets. I can’t wait to redo my own kitchen. Delightful and spectacular! Thanks for the reveal and the paint colors….just in the nick of time for me! My kitchen remodel has the new cabinets installed and they will be painted next week…..BM White Dove is the white paint choice, and we are still working on which gray to use and where to use the gray. Considering BM Revere Pewter for the kitchen walls and for the family/great room. Such important decisions! White ice granite is coming soon, the oak floors will be stained medium brown; lots of east and west natural light from large windows? Love, love, love your makeover! Can’t wait to see the full reveal. Beautiful! Your kitchen is so beautiful Melissa…I just love it! Kendall Charcoal is my favorite grey…just painted our kitchen island that colour and one wall in our living room…it’s an awesome colour! Can’t wait to see more! Gorgeous!! 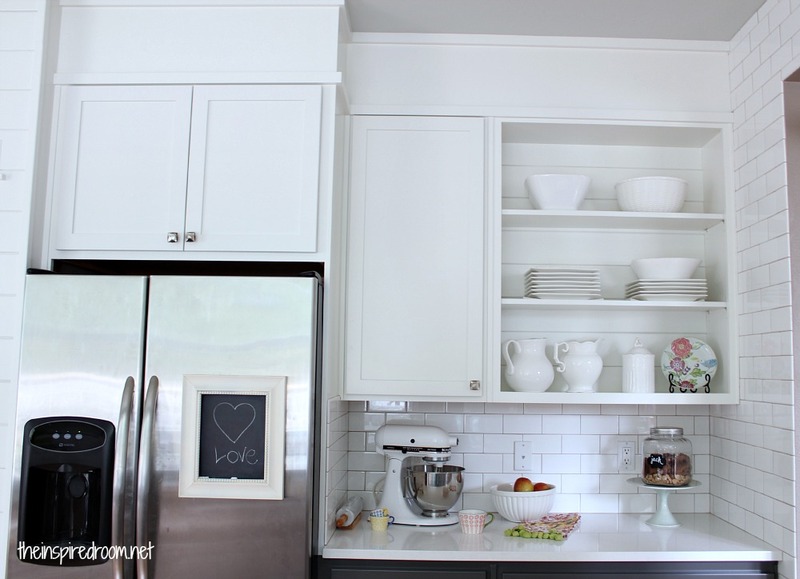 I love the brightness, the spaciousness, the cabinet hardware, and the contrast is perfect. You did a magnificent job putting all the little details together, Melissa!! Time to celebrate!! Absolutely in love with this kitchen! I’ve been putting together what I want when we redo ours and this is pretty much it. All my pots, pans, and misc kitchen stuff is candy apple red so I think it would go perfectly! Thank you for sharing. It’s beautiful! Oh thank you! Yes I love how it looks with so many colors, I’m looking forward to trying a variety of accent colors and seasonal decor too! Love the look of your kitchen….what fun! Is there a special type of BM paint that you used on the cupboards? I want to paint the bathroom cabinet, but I am afraid of chipping paint. Thanks so much. Our painter used Advance! It’s gorgeous! The best chance of long lasting painting is the prep! They look fab Melissa! Very modern and sleek! it looks amazing! i’d love to have my morning coffee in that kitchen, too! enjoy! Just beautiful! I’d love to do some cooking in that space! My 2013 goal is to plan a 2014 remodel. This remodel will fix my previous remodel which was sort of a make do after we first moved in. This will be the real remodel. So I examine all kitchen posts very closely. And you know I am a bit of a modern freak. So, I love your kitchen. Seriously. I really love the white on top and the dark grey on the bottom. I like the classic white subway tile instead of the mosaic glass they show in all “modern” homes nowadays. I have been thinking about white cabinets but was really afraid of the white out effect because I want white counters too. You just solved the problem. I really like that shade of grey. We have too much “warm” colors in our house, but I had my druthers, I would go there. And now that I think about it, your floor is quite warm looking. Sorry for going on and on and on but I am bookmarking this baby. Intrigued to see what you do with the island. AND, these things take forever. As I said, my goal for 2013 is to only PLAN what I MIGHT do for 2014 given time/money! keyword missing above “plan a 2014 KITCHEN remodel”… i need to re-read before I hit enter. seriously. Glad you like it! :-) thanks for all the kind words! Simply gorgeous! I am in love! I have white uppers and gray lowers as well but I used brass hardware. I am hoping to convince my hubby to add some bulk to the tops of the cabinets and make them go to the ceiling like you did. Hopefully your beautiful kitchen can help me achieve that goal. This is just beautiful! So gorgeous! I’ve been planning to paint my kitchen cabinets all white, but you’re making me rethink that. Can’t wait to see the island. It was really a great makeover. Refreshing, always help us to go on and we need it for time to time! I don’t see the time to do mine! Wow! What a HUGE transformation! It really looks beautiful, Melissa. Stunning! I would love to paint my oak cabinets, but I think my husband will be a hard sell. Looking forward to the full reveal! Love it!!!! You have given me some relief this morning because we have cabinets in very similar colors going into our new house this morning. Although I played around with the gray and white color scheme in our last home and have loved it anytime I see it I still get nervous about the look in our space! It looks so so great and you’ve got me all excited! Beautiful job! Gorgeous! Love your new kitchen and the lighting is amazing! Gasp! It’s gorgeous! Totally worth the wait. Now I’m eager to see what you’re doing with the island. Love the quartz countertops and the dark cabinets. It looks fresh. Love that topiary too. That’s it. My cabinet doors are coming off! Love the new look, ESPECIALLY the white cabinets on top and the charcoal bottom ones. I’ve been struggling about what to do with my kitchen cabinets because all white is too much white. This is perfect! It looks great! I love how removing upper cabinets gives a kitchen an uncluttered look. And those white backsplash tiles give it such a crispness. Love it! Gorgeous!!! You must be so thrilled! Since we’re neighbors, I’d love to know who you had do the painting. The cabinets look perfect. Did you have them taken to a spray shop? Beautiful! It’s so light and bright-I love it!! LOVE!!! Got to have those sconces for a built in reading nook we are creating! It looks gorgeous so far! Pinning this for sure! It looks beautiful! I love the two tone cabinetry, the hardware, and the subway tile to the ceiling. Your remodel seemed to go fast to me. Mine took almost a year! Wow!! Your kitchen looks incredible! I know you are in love! 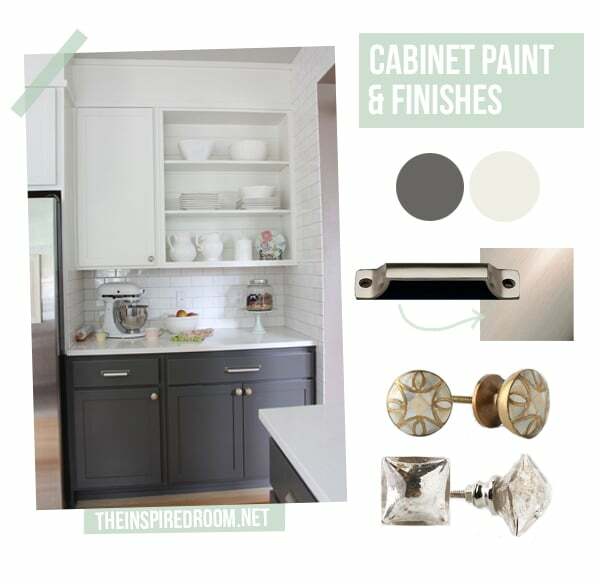 :) I absolutely LOVE the color of the cabinets and the hardware. Everything looks fantastic! What a gorgeous transformation! You did an amazing job :) I especially love all of the light that now fills your space. Love the different knobs you used…..I may need to be a copy cat. Just amazing and most of all beautiful! Melissa, the contrast – dark, light is so stunning. It must be so beautiful in person. Gorgeous, Melissa! I’m loving the contrastyness. (I just invented a word!) Also really digging the sconces and ADORE the cabinet hardware. If you’re anything like me, you want to cook a bunch of food now. It feels so good to finally be in a kitchen that really feels like me! Your kitchen is so pretty. I LOVE IT, did you do a breakdown of cost totals? I live in my starter home and I have for almost 20 years! LOL I need so much done, espescially my bathroom. I only have 1 , I love your site! Any advice for me? Like how to buget and organize a project? Did pros do it or is it diy? Stunning! What a beautiful job! I too would love to have an all white kitchen, but I do have reservations…only because I have 3 sweet darling children under the age of 5…i fear the mess they could make of them! lol! And a husband who is not fond of all white. 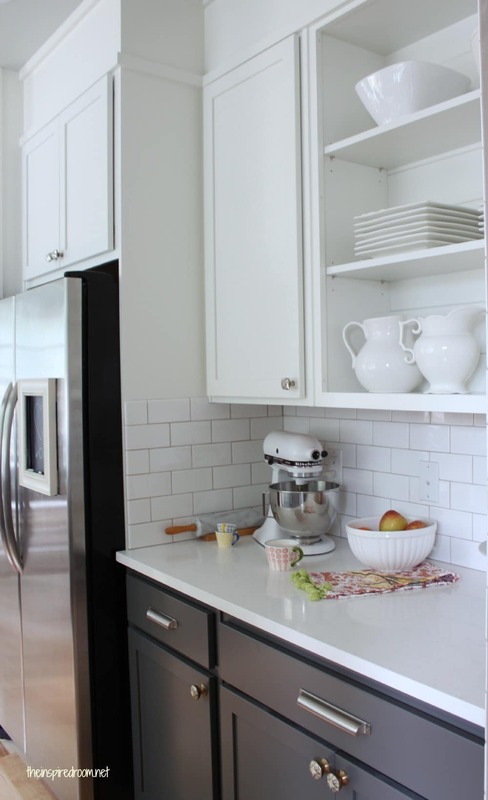 I however LOVE all white kitchens:-) I adore gray…:-) if I may ask besides the reasons you posted for why doing darker lower cabinets, are there any other factors that came into play? Thanks for sharing your beautiful home with us! Sure! Good question, I think it was mostly just what we felt would look the best in our house. We walked back and forth to the kitchen, looking into the room and at the surrounding rooms to imagine all the options. We thought about the light and the windows and how colors might look. Beautiful! Just wondering though – you took out the over-the-range microwave. Where is your microwave now? i can’t tell you how excited i was when i read your kitchen reveal post! i am in the midst of a mini remodel in the kitchen and wanted to change my lower cupboards from black to a gray. i have been looking at BM paint colors and had almost decided on iron mountain but was wondering if it was still too dark. my upper cupboards are a medium wood tone shaker style which i love (many layers of white paint were stripped off 4 years ago) and the lower ones were not in great shape so they were painted. i have ikea wood countertops & original wood flooring. the appliances are stainless with black just like yours which has helped me to “see” how the change will look in my own kitchen. thanks so much for the inspiration and decision-making! so gorgeous! i love hown’t wait to re-do our kitchen. i’ve been dreaming of an all white kitchen, but now you may have inspired me to think outside the (white) box! I love the mixed hardware you used! Fantastic. It is fabulous! I love EVERYTHING about it!!! I love your kitchen – it has turned out gorgeous! I have a kitchen from the 70’s that we will be remodeling in the next year or so. I’m dying to get rid of upper cabinets, but I’m afraid of losing the storage. I have a question for you. Where do you store all the things like plates/cups/ etc that you would’ve had in your upper cabinets? If you moved them below, where did you move those things? Do you have storage somewhere else, or did you pare down your needs to just be basics? I don’t have a pantry, so I’m afraid to give up storage! Hi Melissa! This is my first visit to your blog and what do I see but my DREAM KITCHEN!!!! Love love love what you have done; I’m nuts about the subway tile and no uppers around the stove area and the other side is just as gorgeous. I am going to show hubby this kitchen in hopes that I may be able to do something similar! I’ll be going to snoop around the rest of your blog now. Once again, LOVE your kitchen!!! We are wanting to paint our cabinets…I read one of your comments above that said how importing the prepping process is to ensure a good, chip-free paint job. Can you tell me what kind of prep work you had to do before you painted the cabinets? We actually used professional painters for this job, but the important steps if you are doing this yourself are to make sure that cabinets are clean and free of dust and grime. Any dust at all will show in the finish of the paint and grime will cause the finish to not adhere properly. Priming cabinet doors and sanding them perfectly smooth prior to painting is also really important. Our cabinets drawer and door fronts were removed and actually sprayed on site, so the painters spent a ton of time masking off the room with plastic and tape. You can also brush on cabinet paint and get a beautiful finish, as long as you have prepared the surface! I’ve seen a bunch of helpful tutorials online that will go into more specific details on painting cabinets! Oh my gosh Melissa! You have totally transformed this (already lovely) space into a dream kitchen!!! I LOVE the charcoal & white cabinetry. You had such vision – I can hardly believe it’s the same space!!! Wow, wow, and wow. Stunning. I’m a regular reader, and yes, a mostly silent one, but I just couldn’t keep my mouth shut for this one. It is absolutely gorgeous, Melissa. I love, love, love it. This is beautiful! I can’t wait to see the complete kitchen reveal! We are remodeling a 100 year old home and I am going with a white kitchen and a navy/gray island with white subway tile. What color grout did you use with your white subway tile? Stunning and worth the wait! But since I have been reading you for little while now and seeing all the other pretty things you have done I knew it would be. Look how bright and airy it is! Great job! I love it! Its just how I imagine my dream kitchen, very clean with lots of white & subway tiles of course and the constrating lower cabinets to stop it looking too clinical, well done!! Melissa it is absolutely beautiful!! I love it all! We are building right now and I am painting my kitchen islands a similar color with white cabinets. After seeing how beautiful your kitchen turned out I’m so excited! Quick question for you – what is the specific name of the quartz counter tops you chose? I am debating two white samples and am wondering which one you went with. Thank you so much! Mine are organic white Caeserstone. They were the best white for my subway tile and had enough subtle grayish pattern to not be stark white but not so much pattern or veining that it fought with the variation and grain of my floors! They mostly look pure white unless you really closely. Thank you so much Melissa! That is exactly what I’ve been leaning towards! I call it the “bubble” quartz because of the soft grey/white circles in it. :) SO happy to find your kitchen so I could see a picture of a full slab. Your kitchen is so gorgeous! Thanks for taking the time to answer my question. I really appreciate it! I am DIGGING that charcoal paint! So cool! Did you paint them yourself? Whatever we wind-up doing I’ll be referring back to this post quite a bit! I have been waiting for this reveal!!! Gorgeous! Absolutely gorgeous! I can’t believe those are the same cabinets. So absolutely gorgeous! I LOVE the gray cabinets on the bottom! Hello – love your makeover! This may be a silly question but did you have cabinets removed and sprayed or were they done at your house? Trying to paint my island but want to avoid removing countertops and sink… Well done! This looks fantastic! Can’t wait to watch as you reveal more of this gorgeous kitchen! This is just so sharp looking!! I love the gray cabinets and walls plus all the detail. Can’t wait to see the rest. The kitchen is fab! I look forward to seeing more of it! I am sure it was so much work, but just turned out awesome! Holy cow, this is just SO beautiful. I liked the before but I LOVE the after. Amazing. Can’t wait to hear more. Fantastic job – well done! They say grey is the new black but it’s always been a favourite of mine! Everything looks great so far. I bet your island is going to be pretty stunning! I LOVE it! I can’t wait to see the whole space. 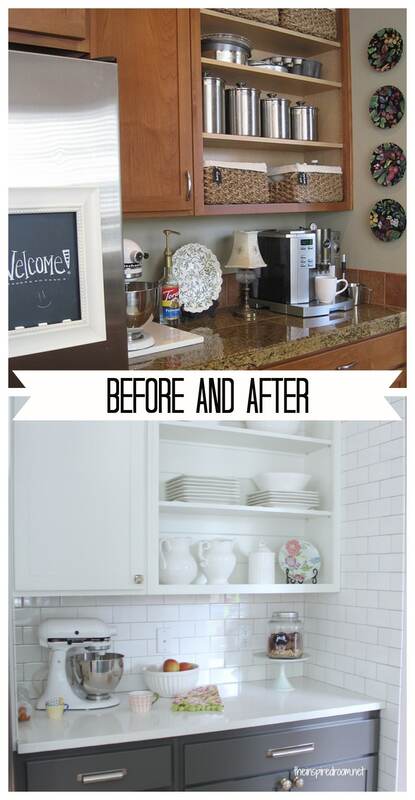 I just repainted our cabinets white, and now after seeing this I wish I had done the lower cabinets in a gray! I’m so inspired by your makeover. I’m also trying to decide on a backsplash. Your kitchen makes me seriously want to consider the subway tile. It looks great with the white cabinets and stainless appliances! i am in awe! gorgeous, melissa! Love the new look. I love the charcoal gray cabinets. I never would have thought of using to colors, but it’s so smart and sophisticated looking. The tiles look great with it too. Can’t wait to see the rest. Your kitchen is beautiful. I love the clean lines, looking forward to seeing the finished reveal. It’s absolutely gorgeous! I love how much light you have in your kitchen now! Soo beautiful, Melissa! I love how open and airy it looks and the contrast of the gray and the white. Thanks for sharing! Beautiful! Fantastic! I LOVE the darker lowers and white uppers!! Glad you went with your gut :). i am in love with the gray and white. you are making me want to repaint my lower cabinets which i did a much lighter gray last year. but then i’d have to paint my upper cabinets a brighter white and then my trim and oh my, just too much painting for me. but it’s fabulous. can’t wait to find out what countertops you went with. I’m bowing down! Stunning, just stunning! I love the gray lowers. It is the perfect color! I love your kitchen! The grey cabinets against the white tile is an amazing combination. I love how modern this is, yet still warm and inviting. LOVE your kitchen…it is absolutely beautiful. Melissa, Love the kitchen! Just to clarify, my Benjamin Moore store only has White Dove, not Dove White. Did you perhaps mean White Dove? Your color is perfect so I want to get it right for my remodel which is starting next week! Thank you!!! Yes, I always get it backwards. :-) thanks! Yay on your remodel! I love your new kitchen! I am in the midst of a kitchen makeover (on a budget bc we’ll be moving shortly) and cannot decide what to do with our cabinets. I love that you put gray on the bottom cabinets to create a contrast with the white (which I also love)! My current kitchen is lacking in cabinets so we are going to add new Ikea ones but I am hoping save the old cabinets around the sink, even though the doors will be different. I’m now wondering if I painted them gray, like yours, if they would seem more like they belong even though the door design is different….any thoughts without seeing pictures? Thanks!! Yes, without seeing them I think if you change cabinets in some areas it definitely makes sense to change colors. 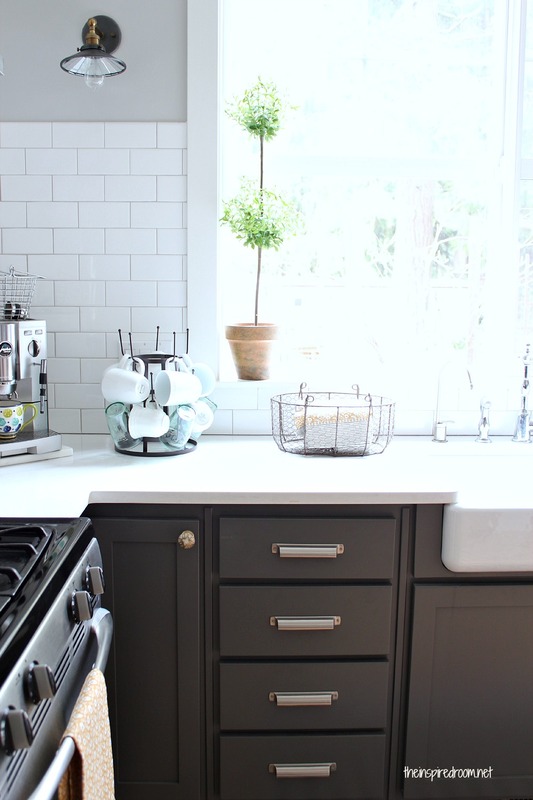 My new post just out today has gray and white kitchen inspiration pictures! This is just BEAUTIFUL!!! I am so happy for y’all!!! Yay!!! Love the kitchen colors. Did you paint the cabinets with brush or did you spray them. They were sprayed, but you can do it either way! I just love the new transformed kitchen makeover, only….. I didn’t see the microwave any place? LOL, I must have a microwave and dishwasher. OMG – DYING!!!!!!!!!!!!!!!!!!!!!!!! THIS IS GORGEOUS!!!!!!!! love the gray, love love love it. love the sconces, the counters and the walls of subway tile. it’s just tooo gorgeous! use it in good health and much happiness! I got the Joni of Cote de Texas seal of approval? WOO HOO! Your kitchen is so gorgeous! I’ve been trying to convince my husband to go with dark grey lower cabinets and I believe I’ve found the pictures to convince him! Looks beautiful! I’m inspired to go and paint my uppers white now too! I absolutely have to pin this for future reference — I, too, have pure white quartz counter tops that I just love, love, love! Best investment ever! It was really nice before… Now it is amazing! I love it! Can’t wait to see the total reveal! Thanks Richella! I can’t wait to show the whole kitchen so you all can see the entire personality. It is fun to be able to do a fresh new kitchen that still feels like me! I definitely am bringing in a few of the elements that I loved from our last kitchen, just using them in different ways or reinterpreting them for this house, I guess! :-) Hmmm…that is going to have to be a new post I think! What is the brand/name of that gorgeous espresso machine? thank you so much for sharing! Looks beautifully~so clean and bright! I must admit I can hardly wait to see the rest! I’m especially anxious to see the shelving you installed and how that flows as well as the new cabinets you installed to the right of the sink :) I am thinking about having my cabinets painted as well (would love a very, very pale grey blue) so any info you have in regard to that process would be so appreciated! (prep required, type of paint; oil based vs. latex, approx cost) I don’t know where to begin with the process! Thanks for any advice you might have! Your kitchen is an entirely different place now. In our last house, I considered painting our boring cherry cabinets, but it was before the time when everyone was doing that, and I couldn’t convince myself to paint them when there was technically nothing wrong with them, and they were only about five years old. But as your kitchen shows, it makes such a difference and can create a totally different look and feel. We have cherry, too! I’ve even gone so far as to take the doors to have them assess to paint twice and was talked out of doing this. I recognize that cherry is a pretty wood (that’s the problem) but cherry cabinets in our kitchen are just not me. Good luck. I’m empowered by this kitchen! Beautiful work! Oh My Goodness! I haven’t stopped by your blog for a while and apparently I missed this! It’s so amazing….I would never have guessed that it is the same kitchen – it looks brand new. I love the dark lowers…and the sink is gorgeous. Girl, it looks FABULOUS. I mean, I love the classic style with the small risks–that hardware….wow. Love it! What a fabulous make over. I’ve just found your site, as I was searching for Anthropologie!… not certain how this happened but, I was so attracted to your kitchen that I had to stop and look. It’s just beautiful! We bought a house with cherry cabinets that I want to do something similar to — white and charcoal treatments. I’m so curious how you painted your doors. Did you do it yourself? Did you send them in to be lacquered? Do you have any advise for painting the cabinetry? Thank you so much for sharing. If you happen to see this, I would be so grateful to hear about this. Thank you for your time. We had a professional painter spray them. They took the doors off and sprayed them, and they also sprayed the cabinet boxes. This looks great. We won’t be able to a reno for awhile due to being renters, but one of the first things I want to do too is pull down a lot of the upper cabinets or at least have open shelving there. Some people give me a weird look when I say that, but it really feels more open and airy. Can’t wait to see the full makeover. I just pinned your kitchen! I am so in love and I can’t wait to see it finished. I love the pulls and knobs you choose. Good choice to have the cabinets sprayed. I painted mine myself and I’m not terribly happy with all of the brushstokes. Live and learn! Absolutely lovely. Done with such taste and a touch of comtemporary. As I coined it with some friends years ago, very “contemporonial”. Ha. Anyway. I especially love your subway tile treatment. I inherited (from previous owner) a kitchen with slab granite counters and island and, much to my dismay, a slab granite backsplash. I can’t imagine the amount of money poured into slab granite all over the walls. While I like granite, I don’t love the particular granite I have and plan to replace the countertops with quartz or soap stone. I’d love to have a subway tile backspash. I refinished my cabinets and like them, so no need to replace them. Swapping out the countertops is easy enough, but I don’t know HOW I could get the granite backsplash out without major damage to the walls, etc. Do you have any idea if it’s possible to tile OVER slab granite? Heresy, I know, but it may be the only cost-effective way for me to achieve the look I love. Any insight would be MUCH appreciated. Also, as an odd aside, I love your coffee mug holder. Can you share where you found it? Thanks, Melissa! Job well done. Amazingly done. PS. Thanks so much for the compliments on my kitchen!!! :-) I got the coffee mug holder at World Market! Thanks, Melissa! I will ask a tile installer to take a look. World Market…who’d have thunk?!! Great taste and a bargain hunter!!! 1000% times better. The builder kitchen was so dark and depressing feeling. Wonderful job! Hi! I was wondering if I could get the name of the company that painted your cabinets? I live in port ORchard, very near you and I would really like to get my kitchen cabinets painted. Nice job. I’ve been trying to talk my wife into removing the upper cabinets and putting in a SS vent. I hope these pics will help her to see how great it can look. There seems to be a trend to have less uppers. I think it gives the kitchen a more open and less cooky cutter look. I am obsessed with your kitchen! It is my new inspiration. I’ve been wanting to do this for a long time but terrified of picking the wrong colors but you’ve done that for me:) You mentioned in your blog that you used Benjamin Moore, kendall charcoal and white dove but can you tell me what type if paint you used, oil, latex, enamel, maybe their Advance line? We used their Advance paint! I love the finish! when oh when is the final kitchen reveal happening or have I missed it? Love everything about your new kitchen, especially how you chose to make the bottom cabinets darker. Your knobs and pulls are perfection. Drooling…..
Hi Melissa! Can you tell me what finish you used on your cabinets? Satin, eggshell, semi-gloss??? Thanks so much! It’s all so beautiful!!! Hi there. Gorgeous kitchen!!!! I’m so jealous. Can you give a few details on how you prep’ed and painted the cabinets??? I must do the same!!!!! Hi Melissa, what colour did you use on the lower darker cabinets they are incredible. Thank you for your time. In your pics the upper cabinets look bright white.. But the color swatch I have BM ‘white dove’ looks creamy, not bright white.. is that correct? Thank you! That is correct, it is technically a little bit creamy but mostly you would think of it as regular white. Unless you put it next to a really bright white, then you’d probably see the softness in it. I love it! Hey Melissa. Love your remodel. My husband and I are remodeling a kitchen and we are contemplating pure white countertops, but have been discouraged by others not to use it because of it showing dirt all the time. Our distributor also discouraged us from it because of the possibility of staining. Have you had any problems with your white counter? Please let us know your thoughts. We do have three young boys. No problems with staining. Sometimes we do get a mark from a metal pan or something but it comes out with a little Bar Keepers friend so it hasn’t been anything permanent. We love it! If there is dirt to show on my counter, I want to see it :-). I love everything about your kitchen makeover! The dark gray cabinets are gorgeous you did an amazing job on everything. I painted mine a few years ago white and well the bottom ones get so dirty so fast that I’ve decided to go with a dark gray. I was wondering what brand and color you chose for yours? Thanks! 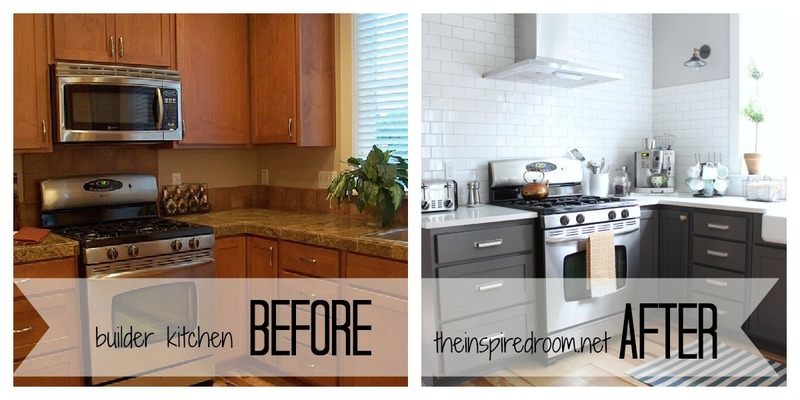 I just found your blog… and this kitchen renovation, it looks fantastic! I love the dark charcoal cabinets… I love it all!! Our kitchen if from at least 4 generations ago, and I was planning gray for the cabinets but no so dark until now… I was actually looking at this pendant lighting from Restoration Hardware just last week, love the style! Just like everyone else here, I love it!! Wondering if you can divulge the specific charcoal gray color you used. 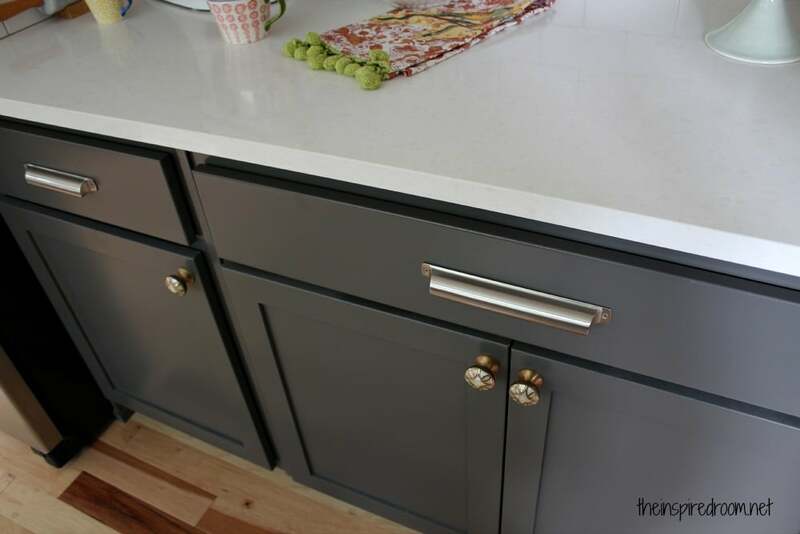 I’m at my wits end – tried 6 different gray colors on my lower cabinets (not entire kitchen, just test cabinets) and didn’t care for any one them. Now have painted black as a test. Not bad, but I love your color and would like to test it in my kitchen. Hi- I echo everyone in saying how much I love your kitchen and the rest of your inspired room blogs! I found you in a search for ikea grey cabinets. I’m not sure if you posted this already but can you tell me if they are in fact ikea cabinets? My plan is to renovate outer new (old) house and we are def on a budget. We will need everything which is overwhelming. 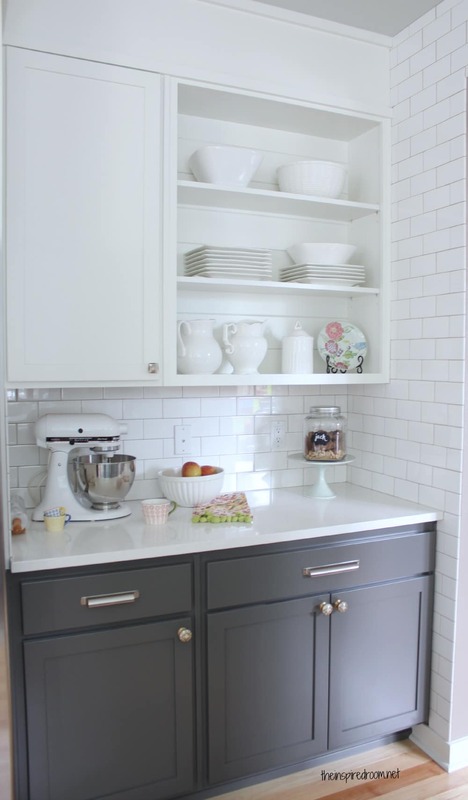 I want to do just base cabinets since I will be making an enormous pantry- so I just want shelving on subway tile.. So similar to what you have!! This make over is incredible. I absolutely love how clean, bright and inviting it feels. 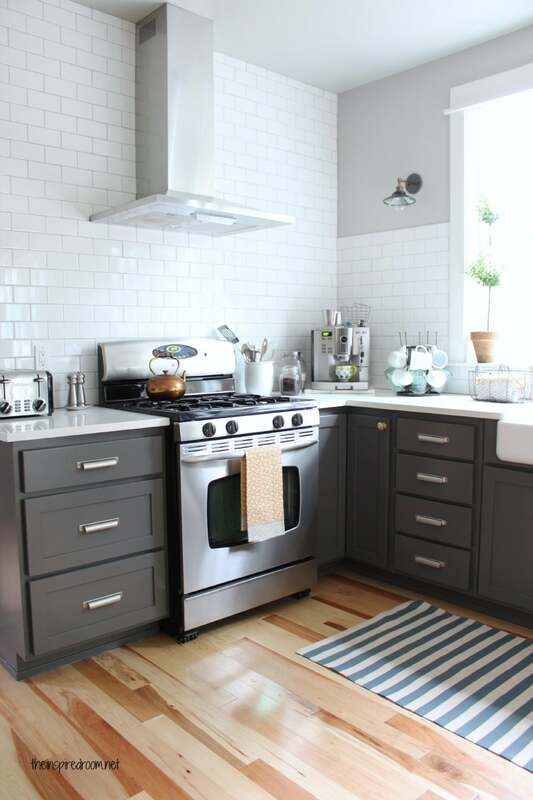 I also really love how you removed the top cabinets above the stove and placed subway tiles with that stainless hood. Well done!!! Hi Melissa I just had a questionas to what type of counter top you have? I love the hire on white and was curious if it was marble, silestone, granite? Hi Claudia! I just responded in a separate comment, but just in case you don’t see that one, here is the post with all of my kitchen sources: https://theinspiredroom.net/2013/04/08/kitchen-remodel-ideas-sources/ The material is quartz! Melissa, you did such a beautiful job on this kitchen! I adore white and gray cabinets in kitchens! I too have a craftsman style home in the Pacific Northwest (new construction), and am trying to change things out to set my house apart from the traditional new construction theme while staying true to the home’s design. I want to change my cabinet colors, and have researched a plethora of ways of going about doing it. I’ve researched Rust-Oleum cabinet transformation kits and customers have said they don’t hold up well. I’ve heard Clark and Kensington is good, but I’m a little skeptical. I read through your comment replies, and I’ve gathered priming is everything. I was curious to know if your painters had to sand everything down before priming, or was simply priming and painting enough? I’m so nervous to begin this project, but it needs to be done. Any pointers you could give me would be wonderful! I am in love with your kitchen!!! I have an awful oak cabinet builder grade kitchen and I plan to steal many of your ideas to remedy it…haha! :). Can I ask where you got your mug rack/cup rack you have in your counter from? I would love one for our hot cocoa mugs! Thanks! Did you paint the kitchen cabinets yourself or hire someone?? Did you use a paint brush or spray. I don’t know how I would spray them…..
We recently bought a home which has shaker styple expresso cabinets installed by the builder. I I want to add more cabinets in the nook/dinning area which is next to the kitchen island. I wanted to get the ikea white cabinets with frosted galss instead of same shaker style expresso cabinets. I am not sure if this work. Has any one se or done shuch comination cabinets? Can you tell me what type of counters you have in your kitchen? Love your kitchen. Do you find the charcoal high maintenance? I am planning to renovate my kitchen and was feeling confused to choose the right color for my kitchen cabinets. I really love the tips mentioned in the article. Thanks for sharing your wonderful ideas. Will surely follow your tips. Hi, I love your kitchen. I was wondering if you can give an update (maybe even a closeup photo) of how the BM Advance paint has held up over the last three years? It’s not cheap paint and I want to know if it’s worth the investment in time and money. Who do you hire to fill in that space a contractor? I have same problem.